This Workbook was extensively revised and edited in late 2016, so it is up to date and refreshed. Please take a look at the sample pages on the right for information about what is covered in this version. The grant applications of most agencies contain basically the same sections – only the specific names for the sections and the order in which they appear in the application are different. In addition, the principles and fundamentals of good proposal writing – good grantsmanship – are fully transposable across agencies. 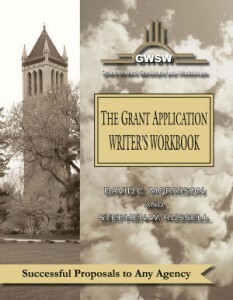 Given those two facts, we have written a generic, any-agency version of The Grant Application Writer’s Workbook. It can be used to write a proposal to any grantor, either federal or non-federal, other than NIH, NSF, or USDA-NIFA. We have written specific workbooks for those agencies. The generic Workbook walks the reader through the preparation of each section and is meant to be complemented by the specific instructions of the agency that is being targeted.